The existance of Area 51, a restricted area at the airforce training grounds Nellis in southern Nevada, is denied by the government. Legend has it that in subterranean places the most peculiar things are going on: contacts with extra terrestrial life forms, research on crashed U.F.O.s, the development of secret weaponry and so on. 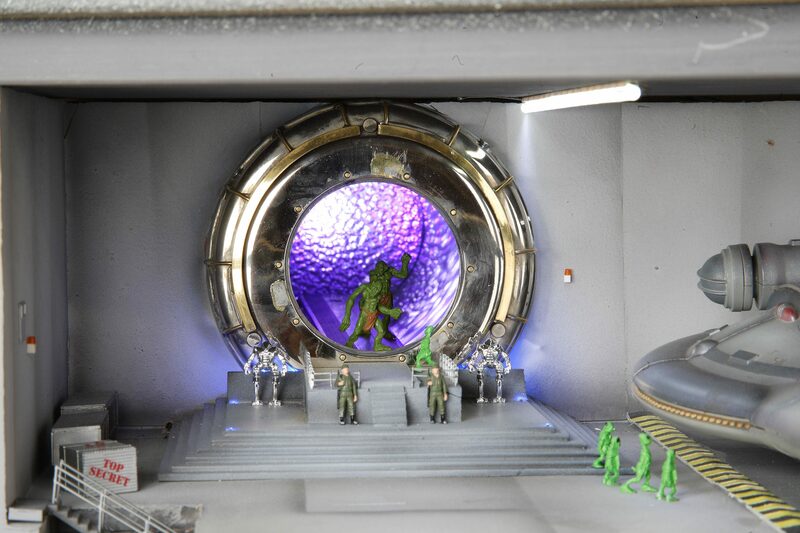 Thanks to our profound research, the Wunderland team managed to gather intel and blueprints to rebuild Area 51. It has been located in the USA theme world for a while now. In its model version the area consists of three different levels. They have been built from perspex and are coated with sanding paper to recreate a realistic concrete surface. The interior was designed using a bit more unusual matter. Two servos (Stargate, UFO), an engine (rotor) and about 300 LEDs were installed. There are 30 watchmen for the area, 50 employees, 20 aliens and two watch robots.